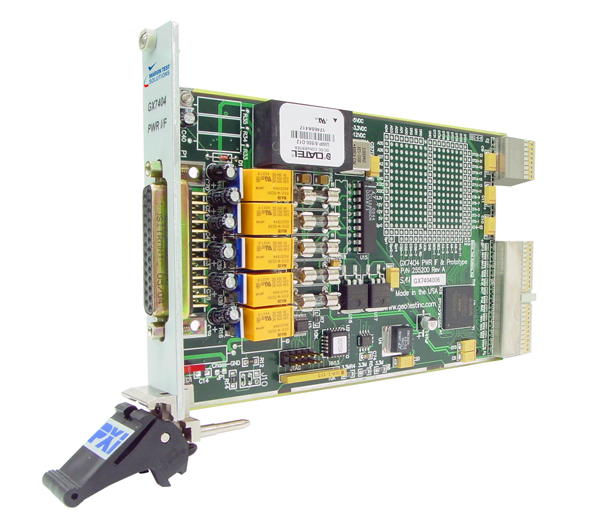 PXI Power Interface Card - GX7404 | Marvin Test Solutions, Inc. The GX7404 is supplied with the GXPXI software package which includes a virtual instrument panel, a Windows 32/64-bit DLL driver libraries and documentation. The virtual panel can be used to interactively program and control the instrument from a window that displays the instrument’s current settings and status. In addition, interface files are provided to support access to programming tools and languages such as ATEasy, LabView, LabView/Real-Time, C/C++, Microsoft Visual Basic®, Delphi, and Pascal. An On-Line help file and PDF User's Guide provides documentation that includes instructions for installing, using and programming the board. UUT Discharge Discharge resistor footprint provided on the GX7404. Not installed by default. User specified. * No line sensing available Note: Specifications are subject to change without notice.